She’s back! Six years after being run out of town over the 2008 Bank Century bailout debacle, Sri Mulyani Indrawati is back as finance minister in a newly-reshuffled Indonesian Cabinet that provides further evidence President Joko Widodo is growing into his job. Helped by a revamped economic team, a lot will be riding on his star recruit’s global credibility, and her ability to tackle an intransigent bureaucracy and complex budget issues in a way that her predecessor, Bambang Brodjonegoro, couldn’t. Just as big a surprise among the 13 changes  was the inclusion of former military commander Wiranto as political coordinating minister in place of close Widodo confidante Luhut Panjaitan, who was moved to the maritime coordinating ministry. His new-found confidence was also evident in the retention of State Enterprise Minister Rini Soemarno the sworn enemy of former president Megawati Sukarnoputri, matriarch of Widodo’s Indonesian Democratic Party for Struggle (PDI-P). Indonesian analysts were encouraged by the fact that the Cabinet is now comprised of 21 professionals and 15 party members, including one each from the Golkar and National Mandate (PAN) parties, the two newcomers to the seven-party ruling coalition. Insiders say not even Panjaitan was unaware he would be making way for Wiranto as compensation for the ouster of two ministers from Wiranto’s People’s Conscience Party (Hanura), which has supported the president from the outset. Indrawati’s comeback had never been hinted at, although Widodo made a half-hearted attempt to lure her into his first Cabinet in late 2014 and has made several overtures since then. 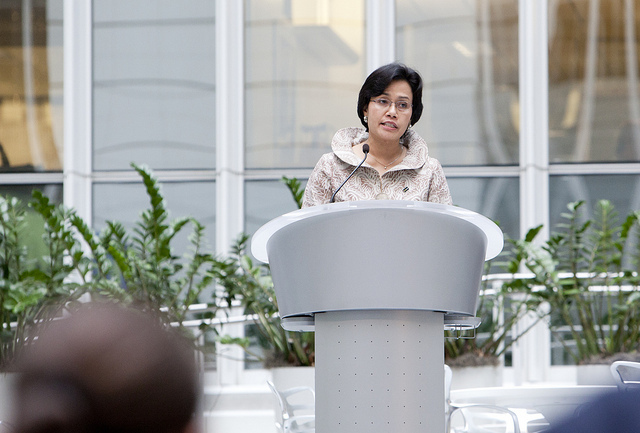 Why would the highly-paid World Bank managing director  be drawn back into a political arena that had treated her so harshly as finance minister in the Susilo Bambang Yudhoyono Government? The answer may simply lie in the deep love she has for her country. It’s also clear the political climate has changed in the past six years, with her chief adversary, former Golkar Party chairman Aburizal Bakrie, out of active politics and Golkar now part of Widodo’s newly-expanded administration. Indrawati resigned in May 2010, under incessant attack from Golkar politicians intent on unfairly blaming the country’s foremost reformist for allowing the bailout of the looted Bank Century  to balloon from US$70 million to close to US$700 million. Friends who met her in Washington a month ago said Indrawati did say that despite her $500,000-a-year salary—which has helped secure her family’s future—she was bored and looking for new challenges. The latest approaches were in mid-June and took on a new seriousness when she visited Jakarta for the post-Ramadan holiday, with Widodo apparently providing assurances Bank Century would stay buried and that he would have her back on policy issues. With even vice-president Jusuf Kalla in the dark, the president timed the Cabinet announcement for a long-planned speaking engagement Indrawati had in Jakarta. Indrawati will focus initially on managing a newly-introduced tax amnesty and working with Thomas Lembong, who was moved from trade to the Investment Coordinating Agency, to attract foreign capital needed to revive Indonesia’s manufacturing sector and build new infrastructure. Designated banks report an increased flow of repatriated funds held by Indonesians abroad, but they doubt it’ll reach more than a quarter of the Government’s ambitious target of Rp165 trillion (AU$16.5 billion), which it’s relying on to keep the budget deficit below the legal limit of 3%. Panjaitan, a retired four-star general himself, appeared disappointed at being replaced as political coordinating minister after all the valuable heavy lifting he has done in shoring up Widodo’s political support over the past 18 months. He and Wiranto aren’t close, but Panjaitan is a master at adjusting to new circumstances, shown in the bridges he has built to Megawati and opposition leader Prabowo Subianto, Widodo’s opponent in the 2014 presidential race. In the two years leading up to that election, Panjaitan was head of Bakrie’s success team, though for him it had less to do with the tycoon and more to do with heading off the front-running Prabowo, a bitter rival from their military days. When Bakrie failed to progress in the polls, Panjaitan switched allegiance to the wildly-popular Widodo, his partner in a Solo furniture business who was almost undone by Megawati’s long delay in anointing him as the PDI-P candidate. A coal-mine owner, Panjaitan can take comfort in the fact that his new portfolio gives him oversight of the Mines and Energy Ministry, which might not be good news for US mining giant Freeport with whom he has had several run–ins. Like Indrawati before him, the removal of mines and energy minister Sudirman Said is a sad reminder that for all of Widodo’s earlier good intentions, politics and vested interests remain powerful influences in today’s Indonesia. Competent and reform-minded, Said had public spats with Panjaitan, outgoing maritime coordinating minister Rizal Ramli and even Widodo himself, the latter over delays in the implementation of the 35,000-megawatt power program . Said was also opposed to the President’s decision to go ahead with the onshore development of eastern Indonesia’s Masela gasfield , regarded by almost all industry experts as the worst judgement call of his presidency. Widodo’s surprise appointment of Arcandra Tahar—who has lived for two decades in Houston, Texas, running an offshore exploration company—seems to support recent reports that the President is reconsidering that decision. Along with his coup in recalling Indrawati, it would go some way towards convincing investors that the reshuffle marks a promising turning point. John McBeth is a Jakarta-based correspondent.